The record is made up of 1 file (268 folios). It was created in 9 Jun 1937-28 Jul 1937. It was written in English and Arabic. The original is part of the British Library: India Office The department of the British Government to which the Government of India reported between 1858 and 1947. The successor to the Court of Directors. Records and Private Papers. give us security unless we have surrendered our arms. all connected to me such as property etc. to do so”. sheep, 100 donkeys. 10 camels were taken away by Bedouins. ten camels were taken away by Bedouins after the peace. This file contains correspondence regarding tensions between Qatar and Bahrain over the ownership of Zubarah 18th-century town located 105 km from Doha. and related clashes that took place between the forces of Qatar and members of the Al Naim tribe (allied to the Al Khalifa, the ruling family of Bahrain). Much of the correspondence relates to British-mediated negotiations and as such, it consists of letters (in Arabic and English translation) between Tom Hickinbotham, Britain's Political Agent A mid-ranking political representative (equivalent to a Consul) from the diplomatic corps of the Government of India or one of its subordinate provincial governments, in charge of a Political Agency. in Bahrain, and the rulers of Qatar and Bahrain, Shaikh ‘Abdullāh bin Jāsim Āl Thānī and Shaikh Ḥamad bin ‘Īsá Āl Khalīfah, respectively. 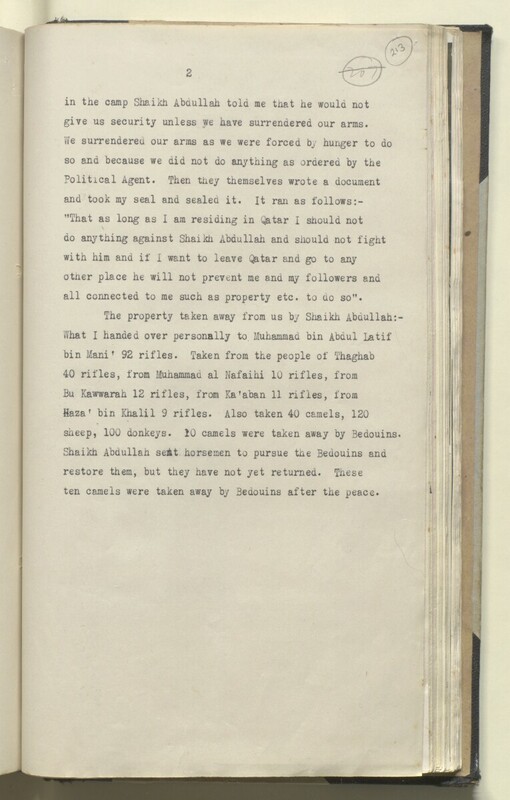 The file also contains correspondence between Hickinbotham, Shaikh Rashīd bin Muḥammad, Chief of the Al Naim tribe and Charles Belgrave, the Adviser to the Government of Bahrain. The file contains copies of British Government correspondence from 1874-1876 when similar tensions had arisen between Qatar and Bahrain over Zubarah 18th-century town located 105 km from Doha. (ff 178-197) and also includes a series of 12 black and white, aerial photographs of Qatar, mainly of Zubarah 18th-century town located 105 km from Doha. (ff 251-263). Foliation: the main foliation sequence (used for referencing) commences at the front cover and terminates at the back cover; these numbers are written in pencil, are circled, and are located in the top right corner of the recto The front of a sheet of paper or leaf, often abbreviated to 'r'. side of each folio. An additional incomplete foliation sequence is also present in parallel between ff 219-234; these numbers are also written in pencil, but are not circled, and are located in the same position as the main sequence. A previous foliation sequence, which is also circled, has been superseded and therefore crossed out.